Rabbit Stew: Hunting Psychology:The Very Image of a Hunter. At two thirty this afternoon - at a loss for anything else to do since this is Sunday and I live in a small, dull town in the West Midlands - I took my rifle out with me to the fields and, with some wincing discomfort because I've managed to strain my neck, lay down by the side of a fence about twenty-five yards downwind of a rabbit burrow that I knew to be a lively one. It does feel strange, to me, doing this in broad daylight in the middle of the afternoon, but the glory of the Spring sunshine had been powerful enough to lure me from my computer - so perhaps it would be strong enough to lure rabbits from their burrows? I hoped it would. But the weather! How marvellous it is - after months of shivering in the dark under the frost of winter hedgerows - to lie in a field and be warm again! How wonderful it is to hear birdsong and watch bumblebees bumble by! It was a pleasure to lie there, but, the joy of Spring aside, the prospects for shooting didn't seem that great: there were no rabbits to be seen anywhere along the fence and the whole length and breadth of the field seemed - apart from the wandering bees - quite motionless. I still have it fixed in my mind quite strongly - even in spite of the last rabbit I had which was shot at just this time of day - that the hunting of rabbits is a thing that happens in low light - at dusk, at dawn, and, really, at these times only. Happily though, my fixed ideas on this matter didn't seem to carry so much weight in the animal kingdom since - right then - two boisterous rabbits popped straight out of the burrow in front of me and commenced to run around. The click from the safety catch on my rifle gave them pause - but it wasn't enough to send them back to their burrow. 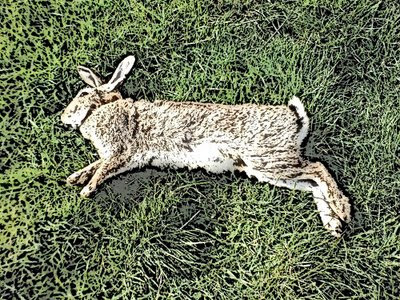 Afterwards, and thinking of this blog, I took a picture of the dead rabbit. 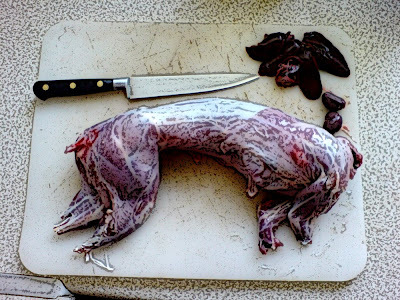 Then, while I was gutting it, I thought about how peculiar a thing it is to take a photograph of an animal that you've just killed in order to display the image on the Internet. I left the field and walked home beside a busy road. Walking home while carrying a rabbit always makes me feel a level of pride and happiness that is - to be frank - quite embarrassing. I really enjoy eating rabbit that I've caught myself, but sometimes I wonder if this isn't outweighed by the pleasure I take in being seen to be someone who has shot a rabbit. It's almost as if, for me, there's as much if not more gratification in being seen to be a hunter than there is in actually hunting - which, when you think about it, is rather odd. But I suppose it's no more odd than, for instance, when you've just shot a rabbit, thinking, Great! Now I can post a picture of this dead rabbit on my blog! It's as if - for me, at least - there's a temptation to believe that the representation - the photo of the rabbit, the being seen by others to have shot a rabbit - is a thing of more value than the thing, or the act, in itself. The bit from the gospels about fasting comes to my my mind when I think about this: Fast, but don't be like those people who go about looking miserable, showing off about how difficult it is to fast. Or, in other words, do it without seeking a satisfaction in being seen to do it. There's a tree stump outside my flat and, with the help of a cheap meat cleaver I got from Ebay, it makes a handy butcher's block. One of my neighbours (and two of her cats) came out while I skinned the rabbit outside my shed. Pleased to see what I was doing she cheerfully told me about going out after rabbits with Springer Spaniels when she lived in the country years ago. I told her that I'd only just figured out how important it was to soak rabbits overnight before cooking them and she told me that she'd always done it this way herself and that, yes, it did make a real difference. I went inside, finished cleaning the rabbit and put it in to soak overnight. Then I sat down, moved the pictures from my camera phone to my laptop and - of course - began to write my blog. Why does the rabbit have that black pattern all over it? Just curious. God I wish I could write a post like you do. I've just come across your site. Thanks for the inspiration! Thank you very much for your kind comments! Writing is much harder than shooting and I certainly do feel as though I'm trying to learn how to do both.